A very cute vintage Gretsch guitar with a fabulous 1950's color motif and styling! This model was not offered in other finishes and had a short 5 year production run. It features a painted Lotus-Ivory colored Top, Black Double Ivory-bound body, Red Truss Rod cover with matching Red Tailpiece insert and glowing Chrome hardware. The 3/4 size Model 6115, dubbed the "Rambler", was introduced in 1957 and features a DeArmond Pickup, Hollow body archtop construction, 23 inch scale length and Florentine Cutaway. The body is 13.5" at the lower bout and is 1 7/8" deep. It is commonly believed that Gretsch introduced this smaller model to have a 3/4 size electric instrument to compete against Gibson's ES-140T 3/4 guitars. I have examined, tested, serviced and set-up this instrument and found it to be factory-correct and fully functioning in every way. The guitar shows normal signs of usage but is generally in very nice, clean condition. The back shows many marks, dings and small dents that are difficult to photograph. It has been played prior to me acquiring it long ago. 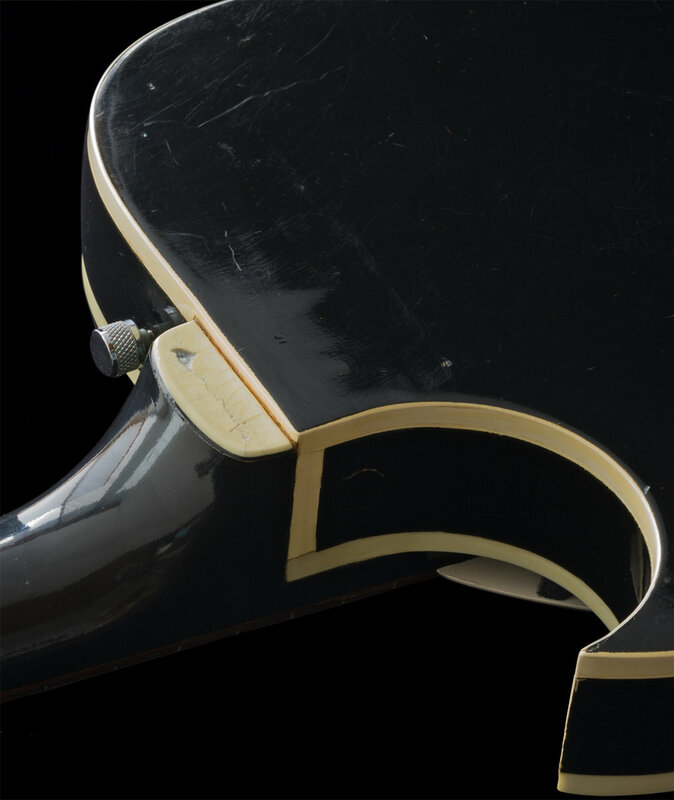 The binding on the Heel Cap has started to shrink and crack, but appears solid and the body binding is generally in very good condition, it is well known that many vintage Gretsch instruments suffer from deteriorating bindings. The CASE is a late 1950's era-appropriate Gretsch Duo-Jet case, which is a bit too long for this model guitar, but my feeling is that this case was sold with the Rambler back when it was new. 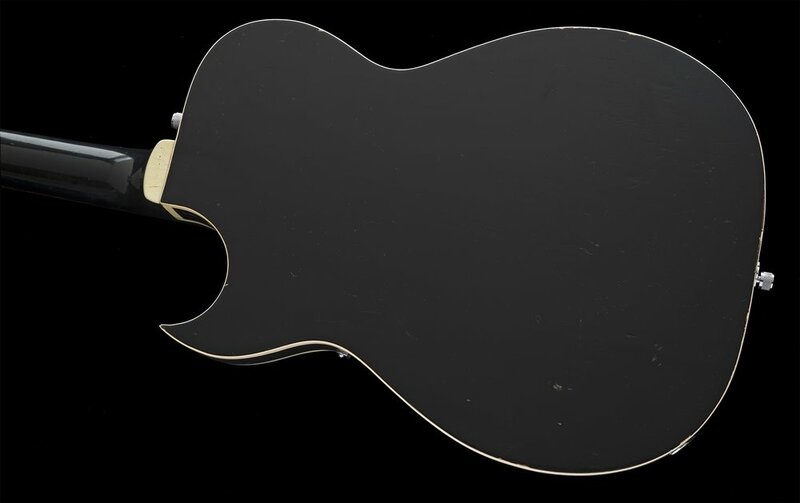 It was a common practice for a Music Store to sell an incorrect case with a guitar, if it fit, out the door it went. I have seen this MANY times during my multi-decade buying and selling career and it still happens in stores today! The case is in matching, clean condition with a functioning handle, latches and hinges. The guitar has just been set up with a set of D'addario XL 11-49 gauge strings. I acquired this guitar 25 years ago while running my store. I had begun a collection of smaller-sized guitars, including some Gibson ES-140 models as well as a few small Gibson and Martin flattop acoustics too, and I decided to keep this little gem. This guitar is now 60 years old and has been in my personal collection for decades and has been spared all of the "circulation" that most instruments being offered online today have undergone. The little guitar is quite lovely and has not had any parts restoration or any modifications. This example is Factory-Original and Cute as a bug!